This 2014 Pershing 64 was delivered new in Chicago to her current and original owner. 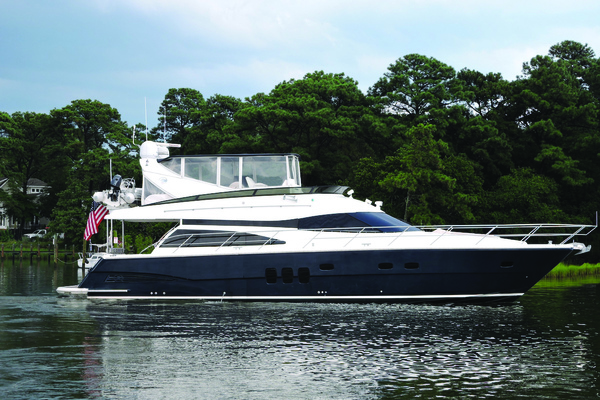 With only 370 hours this Pershing 64 has been maintained with an open checkbook. Always enjoyed in the fresh waters of the Great Lakes and stored indoor heated in the winters this boat is immaculate! Always updating the owner of this Pershing added a Seakeeper Gyro Stabilizer NG9 in 2016, Yacht Controller, and Furuno NavNet TZ 14" Touch the winter 2017.This Pershing 64 is a 10...and available for immediate delivery! United Yacht Sales New Jersey would love to guide you through a personal showing of this 64' Pershing 64 2014. This yacht for sale is located in Chicago, Illinois and priced at $1,995,000. For a showing please contact us by filling out the form on this page and we will get back to you shortly!